NEW YORK (AP) — The bad beginning to the road trip is behind them and the Trail Blazers are ready for the rest. Even if Milwaukee and Golden State are two of the toughest stops on the NBA schedule. 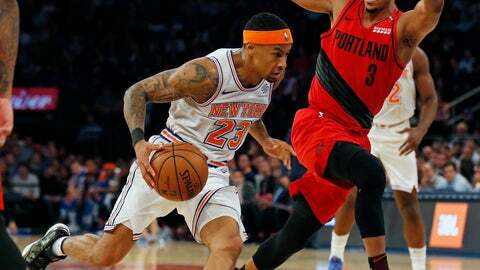 CJ McCollum scored 31 points, Lillard had 29 points, eight assists and six rebounds, and Portland beat the New York Knicks 118-114 on Tuesday night. Jusuf Nurkic finished with 13 points and 11 rebounds for the Blazers, who have won two straight after dropping the first two games on their trip that now heads to its difficult conclusion. Portland plays Milwaukee on Wednesday and closes it at Golden State on Friday. Both teams are 8-1 at home. Portland’s star guards provided most of the offense in a game that was close most of the way, and Evan Turner helped the Trail Blazers finally pull it out when he put back a missed shot with Portland clinging to a two-point lead and 9.5 seconds remaining. Tim Hardaway Jr. scored 32 points for the Knicks, who dropped their sixth straight. They were a bit better than the previous games of the skid, when they yielded 126.2 points per game, but not good enough to stop the early Western Conference leaders at 12-5. Hardaway has scored 30 or more points in three straight games. The Knicks changed lineups again, going back to veteran Kanter over rookie Mitchell Robinson at center, and got off to a good start. The Knicks’ lead was 35-33 after Nik Stauskas threw in a 40-footer to beat the first-quarter buzzer. New York opened a 10-point lead early in the third, and that seemed to wake up the Blazers, who outscored the Knicks 24-10 to end the period and take an 89-85 lead to the fourth. The Blazers then opened the fourth with a quick 7-2 spurt, and McCollum had eight straight Portland points as the Blazers took their biggest lead at 104-93 with 7:45 to play. Trail Blazers: Nurkic had his career-best fifth straight double-double. … Portland, which came in shooting an NBA-best 85.4 percent on free throws, was just 12 of 17 (70.6 percent). Knicks: Mario Hezonja made his first start of the season, scoring two points. Only Ron Baker and Luke Kornet haven’t made at least one start. … Burke scored 19 points and Emmanual Mudiay, who has supplanted him as the starting point guard, had 16. Knicks coach David Fizdale said he changed back to Kanter because the 20-year-old Robinson was getting in early foul trouble and having to come out of the games too quickly, affecting the rotations. He said that wouldn’t be as much of a problem with Robinson in a reserve role. The Knicks held a pregame moment of silence for John Rucker, a former New York police officer who died recently. Rucker was invited to training camp in 1950 and became the first African-American to wear a Knicks uniform. Trail Blazers: Visit Milwaukee on Wednesday. Knicks: Visit Boston on Wednesday.